"For the past six years, Ocean Park Christmas Sensation has held a special place with our guests," said Dr. Allan Zeman, Chairman of Ocean Park. "Christmas is about kids, and our Christmas Sensation is geared towards giving younger guests the most authentic and unforgettable Christmas experience. We know they all love real snow, so that's what we're offering. In addition to our 40-foot Christmas tree, we are presenting Ice Spectacular!, at a grand structure that can hold over 1,000 guests at a time. There's also going to be festive and creative workshops at the International Christmas Academy at Kids' World, and a handpicked selection of Christmas dishes and new souvenir items, on top of our regular offerings." Staged over at Tai Shue Wan's Icy Plaza, Ice Spectacular! is a stunning extravaganza on ice set to a sensational soundtrack, performed by a cast of celebrated skaters from nine countries, including five from the Czech Republic, three from the US, as well as a Taiwanese artist. It is produced by Jeb Rand and choreographed by Billy Chapel, both formerly competitive and professional skaters working for Rand Enterprises and Productions of Las Vegas, which also produced the six previous headlining shows at Ocean Park Christmas Sensation. Next door, the Kingdom of Ice - presented by PRO CAM-FIS, presents a shimmering glacial paradise of 40 hand-crafted ice sculptures of Christmas icons from The Nutcracker, reindeer, gingerbread men and more. To keep guests warm and cosy, all will be provided with windproof and highly breathable PRO CAM-FIS WINDSTOPPER® down jackets, best for the arctic-like conditions of this festive sub-zero labyrinth. At our 40-foot Christmas tree, guests can catch the Hong Kong debut of The Swinging Miracle, an aerial spectacular at the top of the tree with performers demonstrating gravity-defying spins and twirls on sheer silk strands. Nearby, Twinkle Twinkle Christmas Lights will illuminate the entire plaza in an enchanting array of colours, transforming the night sky into a sea of festive sparkles. Younger guests will be thrilled to find Santa and his jolly elves preparing gift stockings over at Santa's Cottage, where guests can come by for photo sessions and surprises. Over at the Lowland Cable Car Plaza is Christmas Around the World, a multimedia globetrotting extravaganza that will transport guests to different corners of the world, via a must-stop at Santa's Village. And, upholding Ocean Park's legacy in edutainment, the International Christmas Academy at Kids' World has been created for children to learn about Christmas cultures and characters from different countries, such as Finland, Africa, China and more. Up in the Headland across from The Abyss, Elves' Speed Race will provide a spot of light-hearted festive fun, as guests cheer on their favourite "elf racer" for the chance to win fantastic prizes. And everywhere the Parkwide Festive Galore features a fanfare of festivities including roving performances, with everyone's favourite Christmas icons. And of course, no experience at Ocean Park would be complete without visits to our precious animal ambassadors. In fact, Santa will be making a special underwater appearance at Atoll Reef every day to feed the sea creatures there. Meanwhile, our resident national treasures, An An, Jia Jia, Ying Ying and Le Le will be frolicking in real snow, at the Hong Kong Jockey Club Giant Panda Habitat. "We are very excited about this year's Christmas Sensation, and it is certainly our snowiest event to date," said Dr. Zeman. "As always, we look forward to giving people what they want, when they want it most, right here at Ocean Park!" 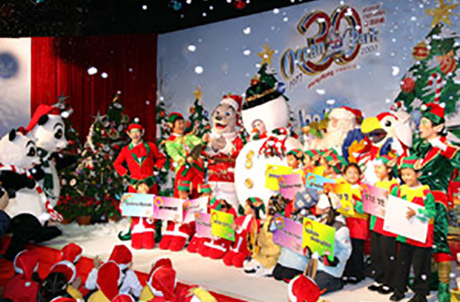 Ocean Park Christmas Sensation begins on 15 December 2007 and continues through 1 January 2008, with daily openings from 9:30am to 8pm, except for 15 December when the Park is open from 10:00am to 6:00pm. Admission is $208 for adults and $103 for children aged 3 to 11. Local senior citizens aged 65 and over, and citizens with the Registration Card for Disabled Persons, can enjoy free admission. About Ocean Park Ocean Park is Hong Kong’s unique home-grown theme park with a heritage of delivering family fun and fond memories. 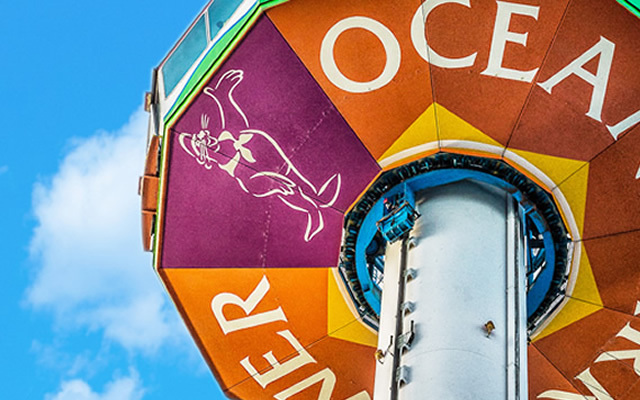 Since its opening in January 1977 as a non-profit organization, Ocean Park has developed itself to be a world-class attraction connecting people with nature, and recognized for its animal husbandry, research and relationship with the community. Over 80 million people have visited Hong Kong's premier park since its inception and Ocean Park has remained committed to offer adults and children experiences that blend entertainment with education and conservation.